I am just a beginner, so sorry for any mistakes i might have made. Why on earth are you making life so complicated when you have Codevision? I cannot tell which line is line 12 so I can't help you more. I cannot tell what you are trying to do. This is a place where comments would be REALLY useful. But it would be even clearer if you defined the pins e.g. Could anyone point me to some kind of documentation or website for codevision? 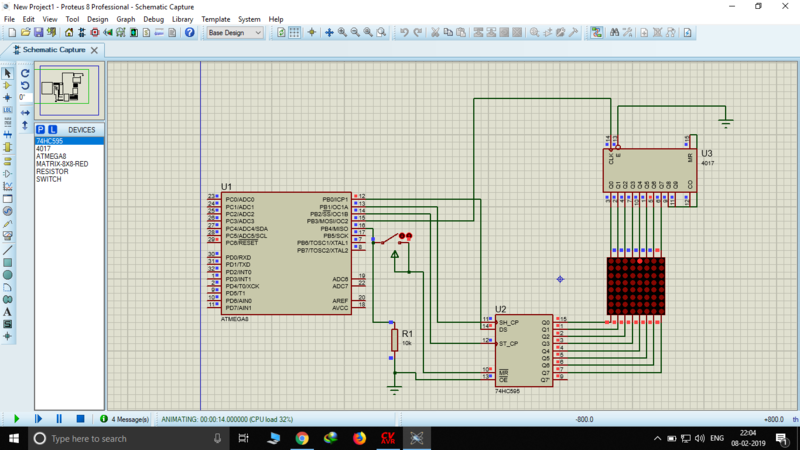 I have been studying directly from avr tutorials. Okay, turns out you were right on all counts. I also had 1 question. Why did I have to use <stdint.h> to use uint8_t? I suggest that you get into the habit of specifying which headers to include. It does no harm. You will find that your code works seamlessly with other toolchains. I'm not entirely sure how it is "naughty" ?? The fact is that almost everything in the device definition headers is done in terms of uint8_t, uint16_t objects so for those headers to work they have to know what "uint8_t" is. So isn't it simply an inevitable consequence of the way the device headers are defined that it has to start by including the <stdint.h> types it uses? C is a very simple language with very few keywords. Everything is built with header files and libraries. Yes, < stdint.h > is a wise include in almost every source file. It removes ambiguity from the "implementation defined" int etc. There is nothing wrong with putting all your "usual" includes into a special "david.h" or "cliff.h"
In fact I quite like the idea that "Arduino.h" or "mbed.h" tend to know EVERYTHING. But this is not part of the C language. The user should determine which headers that she wants to include. The manual for Codevision, all 900 pages of it, is installed when you installed the compiler. It's in the 'documentation' folder. Everything else is just plain 'C' about which there are 100s of websites. Some good, some bad. Just out of interest how would you pass something like PORTB.3 into a function? Or what exactly? Or is it even do-able? It does not - but it draws beginners into a mindset of believing that setting/clearing bits is as simple as setting XXXX.n to 0 or 1. They come to rely on it and are then sadly let down when it is not applicable to out of range registers. Maybe "fallen" is not the right word. You had an "epiphany", perhaps? Anyway, early responders here seem to have concentrated in OP's style and approach. I don't disagree, but first tell why there is a syntax error. Re uint8_t and friends -- I have to do some digging but I seem to recall that it might depend on what level (e.g. C99) the toolchain generally follows. It is a lot easier to use straightforward statements or macros. Of course you can do anything in CV that is possible with GCC. It just requires the appropriate address dereferencing. The CV SFR.# extension makes the code look intuitive. GCC can generate the same ASM sequences but requires convoluted construction to satisfy C syntax. That is indeed an "interesting" question. Doesn't your menu bar have a "Help" section? What does that say? Note the "Help Topics" and "HP InfoTech on the Web" -- doesn't that address the situation? How did you get your copy of CV? What version? Having a bad hair day? Or is it a long time chip on the shoulder? I've always thought that compilers that offer the .n access provide a nice feature for micro work. The only argument against as I've stated before is that it is non-standard so it can miseducate folks, esp. beginners if they don't realise that it is "something special" and they can't rely on it if they see other architectures/compilers in their future. But if your plan is to work solely with a particular architecture and a particular compiler then I'd always use it if possible as it makes life a lot easier. At one stage you may remember I actually wrote a whole header file generating system for AVRs purely to deliver the kind of Adc.Aden = 1 sort of syntax which is as close as you can get if limited to "standard C" but "normal" C limits this to PortB.b1 = 0 rather than the preferable PortB.1 = 0 which isn't quite achievable. I'm trying to move the dot left by one at every "ON" setting. But the dot is not moving. I strongly advise you to format your code. One click from the Codevision IDE. Life is much better when your code looks neat and tidy. And right again you are. The help section never showed me anything along the lines of PINB. BTW, why does PORTB.4 not work in the same manner as the PINB.4 command? Something to do with input/output? Also, what kind of formatting are we talking about here? I'm pretty sure I have my code indented out properly. Never mind, unlocked now by popular demand.